Government officials say it will take a week or two to bring the vessel to a port 90 kilometers (55 miles) away so that investigators could search for the remains of nine missing people. SEOUL: Salvage crews towed a corroded 6,800-ton South Korean ferry and loaded it onto a semi-submersible transport vessel on Saturday, completing what was seen as the most difficult part of the massive effort to bring the ship back to shore. Government officials say it will take a week or two to bring the vessel to a port 90 kilometers (55 miles) away so that investigators could search for the remains of nine missing people, who were among the 304 who died when the Sewol capsized on April 16, 2014. Most of the victims were students on a high school trip, touching off an outpouring of national grief and soul searching about long-ignored public safety and regulatory failures. Public outrage over what was seen as a botched rescue job by the government contributed to the recent ouster of Park Geun-hye as president. "We just got over one hump ... we are trying hard to stay calm," Lee Geum-hee, the mother of a missing school girl, told a television crew. Bringing the Sewol back to the port in Mokpo would be a step toward finding closure to one of the country's deadliest disasters. Once the ferry reaches land, government officials say it would take about a month for the ship to be cleaned and evaluated for safety. 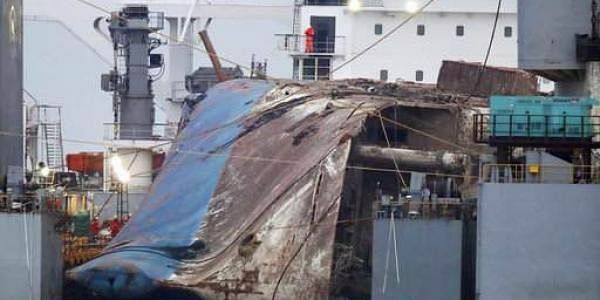 Workers on two barges began the salvaging operation on Wednesday night, rolling up 66 cables connected to a frame of metal beams divers spent months placing beneath the ferry, which had been lying on its left side under 44 meters (144 feet) of water. Relatives of the missing victims, some of whom who were watching from two fishing boats just outside the operation area, cried as the blue-and-white right side of the ferry, rusty and scratched and its painted name "SEWOL" no longer visible, emerged from the waters on Thursday morning. By Friday evening, workers managed to raise the ship 13 meters (42 feet) above the water surface so that they could load it onto the semi-submersible, heavy lift vessel that was about 2 miles away. The timing of the move was vital because dangerous water currents were forecast to worsen on Saturday. Five towing vessels slowly pulled the two barges with the partially raised Sewol tied between them. They had placed the Sewol on the vessel's submerged dock by 4:10 a.m. Saturday, according to the Ministry of Oceans and Fisheries. Lee Cheoljo, a ministry official, said workers will spend several hours disconnecting the Sewol from the barges by removing the wires. They plan to lift the dock and fully raise the Sewol from the water by the end of Saturday before emptying the ship of water and fuel, Lee said. The journey to the Mokpo port could be shorter than the initial two-week estimate, depending on weather and other conditions, Lee said. Victims' relatives and government officials disagree on how to proceed with the searches. The government favors cutting off the passenger cabin area and raising it upright before searching for the missing victims, while families fear that cutting into the ship might harm any victims' remains. A group representing the victim's families has also demanded that it be part of an investigation committee that will be formed to further study the cause of the ship's sinking. Many bereaved family members and their supporters have been demanding a more thorough investigation into the government's responsibility over the sinking, questioning why higher-level officials have not been held accountable. The ferry's captain is serving a life prison sentence for committing homicide through "willful negligence" because he fled the ship without ordering an evacuation. Accusations that Park was out of contact for several hours on the day of the sinking were included in the impeachment bill Parliament passed in December. She was formally removed from office this month and is under criminal investigation over suspicions that she conspired with a confidante to extort money and favors from companies and allow the friend to secretly interfere with state affairs.